To scan with a Lexmark printer, you can use the Automatic Document Feeder (ADF) for multiple-page documents, scanner glass for single pages. This includes small items (such as postcards or photos), photo paper, or thin media (such as magazine clippings). Lexmark printers allow you to scan and print photos, text documents, magazine articles, and newspapers. You can also scan a document for sending a fax. 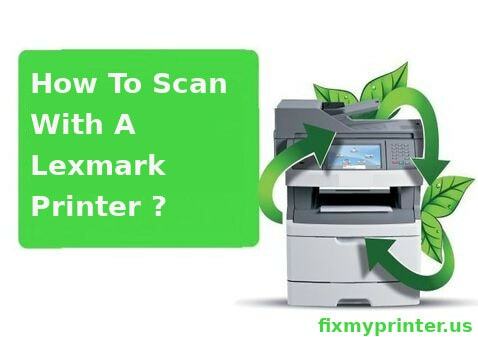 Perform the instructions given below to know more about how to scan with a Lexmark printer. Load a document with its face up into the ADF or face down on the scanner glass. Adjust the paper guides, if you are loading a document into the ADF. Double-tap on the Scanner icon, the Window fax, and Scan screen will open. Select the NEW SCAN option in the Window fax and Scan screen window. Choose document, source (either the ADF or scanner glass) in the new scan screen display. Select Scan at the bottom of the New Scan dialog box. Save the scanned document on your computer. Right-click the scanned folder, select Rename, enter the name and then click OK. Step 1: You can scan and print any document using your Lexmark printer. It also allows you to scan a document for faxing. The scan operation can be performed using the Printer Control Panel. Perform the steps for how to scan with a Lexmark printer as follows. Switch on your Lexmark Printer. Step 2: Unlock the top cover of the printer. Load a primary document with its face down on the scanner glass and close the top lid to avoid dark edges on the scanned image. Ensure that the printer linked to your computer and that both are turned on. Step 3: From the Printer Control panel, press Scan. The scanned document appears on display. You can redirect the scanned image to a computer, flash drive, memory card, or PC over a network. If you select to send the scanned image to the computer, press the OK button and wait until the printer finishes downloading the scanned document. Step 4: Press the arrow until the application that you want to scan appears on display and then press OK. If you choose to redirect the scanned image to a memory card or flash drive, then insert the Memory devices into your computer and move to the next step of how to scan with a Lexmark printer. Step 5: Continue pressing the arrow button until Memory Card or USB Flash Drive appears on the screen. Now press OK if you wish to redirect the scanned image to a computer over the network. Step 6: Navigate to the Network window and then press OK. Wait for the computer name of the network computer to appear and then press OK. Wait until the printer has finished downloading the scan application list. Step 7: Select the quality and original image size accordingly and press OK each time you make a selection. Do not take out the memory devices until the menu indicates that the file had been saved. You can also perform the scan operation in Windows and Mac using a Lexmark printer. Step 8: Go through the instructions described here to scan with a Lexmark printer using Windows. Unlock the top cover of the printer, and then load the document facing down on the scanner glass. Close the top lid to avoid dark edges on the scanned image. Step 9: On your Window, tap Start, click All Programs or Programs and then select the printer program folder from the list. Select Lexmark Productivity Studio. Next click Scan in the Photo Printing section of the main screen and follow the on-screen instructions to complete the process. Step 10: For how to scan with a Lexmark printer using Mac, follow the description here. After loading the document in the printer, double-click the printer folder in the Finder desktop. Select the Series Center, choose the type of document to be scanned, in What is being scanned? and then click Scan.